It’s been quiet in this space the last few weeks. Work and travel have slowed me down. The business of the day is conceptual illustration. Our Word & Image 2 class is at work on an editorial project, based on an Economist article from last week on the possible effects of North African Turmoil on oil prices and the world economy. As I was suggesting yesterday morning in class, the problem is really a rhetorical one. How can figurative devices be used to create visual ideas, as opposed to verbal ones? These things are easier to show than explain, so here are a few examples. At the top of this post, Brian Cronin solves the problem of diabetes by using a visual pun of the bite mark to double things up. As the diner consumes his unhealthy food, he himself is consumed. Above, a classic from the great-granddady of them all: Thomas Nast. 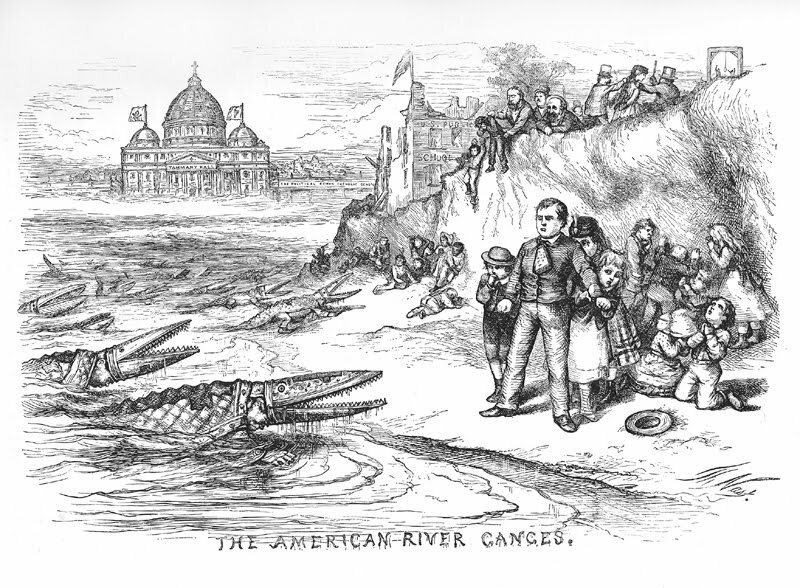 The virulently anti-catholic Nast fuses a bishop’s mitre and alligator jaws to produce an ecclesiastical menace in the American River Ganges. He found a similarity of form and built a potent metaphor from it. Next, a Craig Frazier illustration designed to communicate an increase in power. A simple scale shift (rhetorically, hyperbole) produces a striking contrast and potent image. We absorb the image as an idea, not a seascape. Here’s a typographic solution: Christoph Niemann’s Risk builds a picture out of dimensional letterforms to dramatic effect. Finally, an offering of my own, from some years back. The phrase “boots on the ground” literalized into an image. (Technically, this employs synecdoche, the use of a part for a whole.) I’m not particularly good at this work myself. I don’t pursue it, preferring reportage to pictorial metaphor-making. But it’s a great discipline, and an admirable craft. Class, have at it. I’m already looking forward to Monday!